One of those chocolate makers is Bill Copeland at Glacier Confection in downtown’s Brady District. has already made a name for himself, making every batch of his premium chocolates by hand and selling to exclusive shops and hotels. But this is new territory even for a master chocolatier. This chocolate, Fortunato No. 4 Nacional, comes from a cacao bean that, until its recent discovery, was thought to be extinct. Dan Pearson and his stepson, Brian Horsley, were trekking through the mountains of Peru, delivering food and supplies to mining companies, when they made the discovery. In a dark and mountainous valley, they came upon some unusual trees with giant, football-sized pods hanging from the trunks. The men had found cacao pods, but not just any cacao pods. These were pods that, for years, had been untouched, free from cross-breeding or tampering. Copeland said the Nacional pods were thought to have been extinct, making the discovery unbelievable to some. Pearson sent samples of the beans to the Agricultural Research Service, a division of the United States Department of Agriculture, where DNA tests confirmed it as fact. Because of the remote location of these cacao pods, production is limited. The cacao pods are transported out of the valley by burro, backpack and motorcycle, Copeland said. Beans are then removed from the pods and sent to Switzerland, where they are pounded and ground in a process called conching. “Most chocolate is conched between eight and 16 hours. This product is conched for 60 hours,” Copeland said. The more expensive the chocolate, typically the longer the conching process, which brings out the full natural flavor of the bean. Bill Copeland was fascinated by the rarity of the beans, but it was the taste that made him passionate. Copeland describes it as buttery smooth with floral and fruit notes. A 2-ounce bar will cost around $12 compared to the same bar made from typical high-quality cacao at $7 to $8. Copeland said he will likely make larger 3.5-ounce bars, which will cost about $20. The chocolate has not yet been packaged, but that hasn’t stopped Copeland from selling it. “(Tulsa customers) are some of the only people in the world who have tasted this chocolate,” he said. In the early 1900s, a curious variety of cacao bean known as Nacional was widely grown in Ecuador. Bygone chocolate connoisseurs rhapsodized over its aroma, complex taste and distinctive floral notes. Then, in 1916, disease killed off nearly all of this variety of cacao tree. Hybridized versions – decidedly less interesting in taste – continued to thrive, but pure Nacional disappeared; most considered it all but extinct. That was until recently, when a father-and-son outfit rediscovered a tiny cache of Nacional trees growing in an isolated mountain valley in Peru. They began carefully harvesting the beans and exporting them to Switzerland, where they’re made into slabs of chocolate. But Montreal chocolatier Allen Rose sees a more inspired way to prepare the beans, considering their legendary status: He’s coating them in their own chocolate so they can be experienced in both pure roasted and prepared chocolate forms. Christophe Morel Chocolatier is the only retailer in the country selling Rose’s creation, and the folks there describe the taste as profound, with flavours that lingers on the palate for up to an hour. The hype surrounding this bean has been huge, but then again, it’s been nearly a century in the making. Thought to be extinct and essentially lost for the past hundred years, the Pure Nacional variety of the cacao tree was just recently rediscovered in Peru. Which is great news for chocoholics, because this type of tree was renowned a century ago and was used to make some of the best chocolates at the time. So what better way to celebrate its return to civilization than by eating chocolate made from its beans! The chocolate — called Fortunado No. 4 and produced by Marañón Chocolate — was recently unveiled at New York City’s Institute of Culinary Education, where experts discussed the beans’ usage. Because the beans are so precious, only certain chocolatiers have been able to produce confections. In fact, only Portland-based Moonstruck has been authorized to sell them in the United States. But they can be ordered online, in the form of chocolate-covered beans and regular bars. One interesting fact is that some of the cacao beans are white-colored and some are purple, which you can determine by biting into the chocolate-covered beans. White beans have fewer bitter anthocyanins (an antioxidant that gives foods their dark hues), and produce a more mellow-tasting, less acidic chocolate. It’s actually the result of a mutation that happens when trees are left undisturbed, as was the case with the Pure Nacional. Crazy! But enough with the background. Let’s eat! The chocolate covered beans from Moonstruck are about the size of peanut M&Ms and are lightly dusted with gold powder. The niblets were smooth and hardly bitter at all, with a nice floral flavor. We could eat these all day! Unfortunately, only one of the beans we got in our package was white. But whatever, we’re eating extinct chocolate! The bar was thick and a lot fruitier and mellower than the beans, probably because it didn’t contain any trace of the whole bean itself. It would probably be best to use this in a hot chocolate, or to sample on its own. Is there a huge difference between this and regular chocolate? Somewhat. In all honesty, if we didn’t know the chocolate was what it was, it’s uncertain if we’d instantly be able to know that it was any different than regular high-quality chocolate, though the mellow, nutty flavor is certainly pronounced. But it was tasty, and we’d eat it again, and that’s what really matters at the end of the day, no? DAN PEARSON was working in northern Peru two years ago with his stepson Brian Horsely, supplying gear and food to mining companies, when something caught his eye. They have 15 tons of it in slabs. A company in Switzerland and one each in Germany, Canada and the United States (Moonstruck Chocolatier, of Portland, Ore.) are making candies and bars with the chocolate. At Moonstruck, an American retailer for the chocolate, Julian Rose, the chocolatier, is coating pure Nacional beans with pure Nacional chocolate. 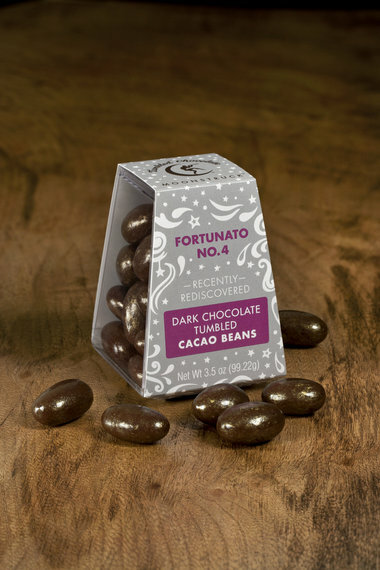 These will be introduced this weekend at the Fancy Food Show in San Francisco, and are sold as Fortunato Tumbled Beans. Mr. Rose said the flavor of this chocolate is so refined that it does not need vanilla, commonly added to chocolate, to round it out. At the Institute of Culinary Education in New York, Michelle Tampakis, the director of advanced pastry studies, said the chocolate was extremely smooth when melted, with a full-bodied, nutty flavor that was not bitter. A rare variety of chocolate bean, which vanished nearly 100 years ago in South America, returns this month to cafes around Portland. Moonstruck imageThese chocolate-covered beans revive a 100-year-old flavor. They’re rare, and don’t come cheap — $11 for 3.5 ounces. Moonstruck Chocolate Co. has licensed the revived Pure Nacional cacao bean, recently rediscovered in Peru. The bean produced a fine chocolate enjoyed during the 19th century, but was thought lost to disease that afflicted its trees. Now it’s back, according to Portland-based Moonstruck, which plans to roll out its new chocolate in New York City today and in Portland next week. “It’s an intense chocolate, but low in acidity,” said Julian Rose, Moonstruck’s chocolatier. The bean was rediscovered almost by accident, according to Rose, growing at an elevation of 4,000 feet in a canyon in northern Peru. Testing linked it to the Pure Nacional variety, thought to be extinct. It doesn’t come cheap — Moonstruck will sell 3.5 ounces of the beans, covered in chocolate, for about $11$12. A 2-ounce bar made from the Pure Nacional chocolate sells for about $8 $12. Note: This article has been revised with updated pricing from Moonstruck.